Hi everyone, it’s Madeline here. We are very excited to sweeten up your darling daughter’s wardrobe (and yours, too!) with this new release. This release’s color palette is bright and happy — perfect for the summer months! These pieces have vacation and fun written all over them. In the women’s and girls’ designs, you will find a combination of soft and beautiful basics, as well as bursts of color in some of your favorite signature Matilda Jane styles. Need a little something sweet? We even have a couple pretties with fresh culinary patterns. Perfection! Now, we all know summer is all about the shorties. This release features a lot of adorable options for your gals, with everything from our signature ruffled shorties in fresh and new colors to sweet chambray options with fun details. Imagine the possibilities! 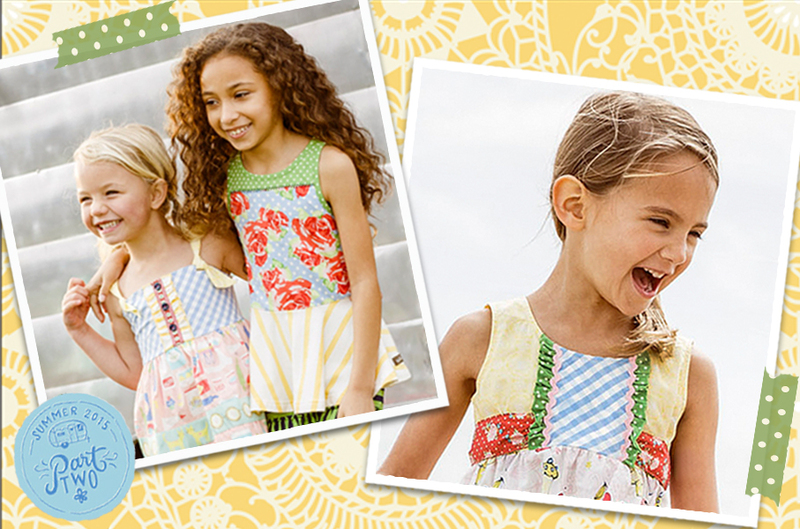 The tween pieces are especially lovely this release — fashion-forward options as unique as the gals who wear them! They are the perfect outfits for everything from a relaxing vacation away to tackling new and exciting adventures. Soft and comfy with a pop of color, what more could your tween ask for? So as we transition from the hurried days of the school year into the lazy days of summer, we hope these fun and versatile pieces will keep you cool and comfortable all summer long! I am dying to see the BrownTown pictures! love seeing the Ellie and Shasta tops!!! I love the color change, and hope to get my hands on that romper, happy to see one for women that doesn’t have boots shorts!! !